Born in Lousiville, Kentucky, Underwood's artistic abilities were apparent even in his early years when, while in elementary school, his teacher enrolled him in a high school art class. But in high school (Corbin High grades 9-11, graduated from Westport High in Louisville), art took a back seat to fishing and guitar playing. Years later, as a sophomore in college, William choose to major in art - much to the chagrin of his father - and made it through his junior year before joining a rock band as their lead guitar player. When the band split up a year later, he returned to college and graduated. His first attempt at graduate school had lasted one year after the news came that the band was reforming. With only one more year to complete his MFA, Underwood hit the road again, playing bars from Michigan to Florida, and living in motel rooms for seven of the ten years between 1970 and 1980. Growing weary of the life of a bar-band musician, Underwood packed his car and moved to Florida in the early 1980's. By the mid 1990's, he was married and a father, and decided to finish the master's degree he began so long ago. This rekindled the interest in creating art that "life" had pushed to the back burner. 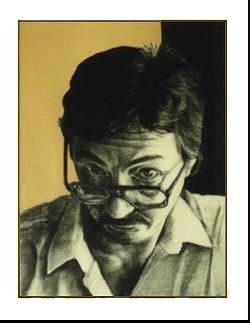 Holding a Bachelor of Fine Arts degree from Eastern Kentucky University (major in painting, minor in drawing), he studied life drawing at the Louisville School of Art, and taught art fundamentals as a graduate assistant at Southern Illinois University. In 1995, he obtained a Master of Arts degree from the University of South Florida, and from 1999 to 2001 completed a two year stint as an adjunct drawing and design instructor at a local college. He was the figure drawing instructor at the Gulf Coast Museum of Art in Largo, Florida for many years. 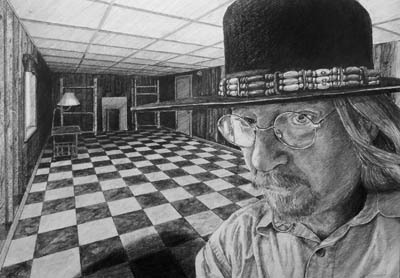 Self Portrait, Charcoal, circa 1995.